The mirage from the north. All over the world there are walls; stone walls, steel walls, barbed wire walls, etcetera, who creates friends and enemies. 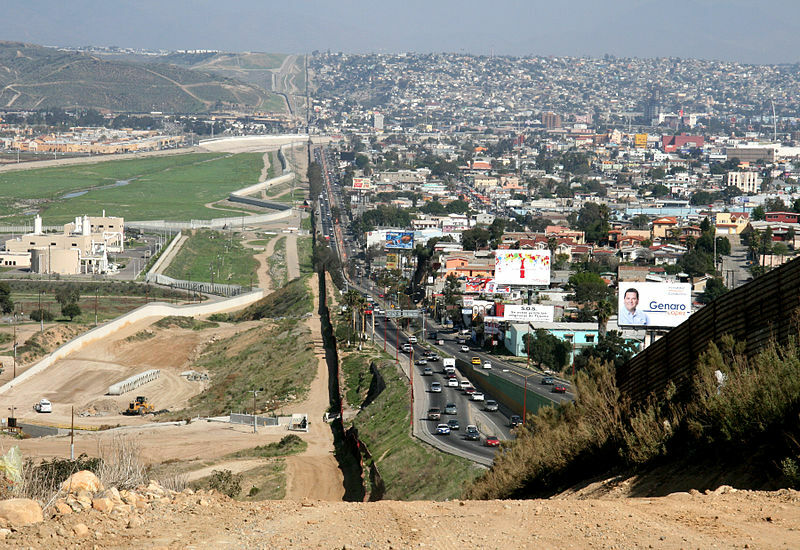 Twenty years ago, there is a wall between the prosperous America and the exhausted Mexico. The wall is an almost 1.100 kilometre economic wall, to block the dream of many Mexicans to a better life in the US. In the United States, the numbers of migrant workers have increased from 1 to 7 million in the period 1996-2001. (Bakker & Gill) Every year, despite the wall, 500.000 illegal immigrants arrive in America. Fifty-six percent of the American citizens agrees with the main thought of the wall. However, between 1998 and 2004, 1.954 people have died by trying to cross the border. The export of capital to non-capitalist, under-developed or cheap labour peripheries and colonies has long been seen as one possible ‘external solution’ or spatial fix for crisis in the core regions of the world economy (Harvey, 2001 p. 146) In the beginning America thought it works to use the immigrants for serving during the war to function as a construction worker and in other defaulting labour. However throughout the years there arose a global regulation and America decide to build a wall from west to east to stop the immigration run. The controversial wall created divisions by the citizens in America. Any person who is disabled by America has a personal story. However, all of them have only one wish: going back to their families. At the border hundreds of illegal immigrants are waiting every day until they have the opportunity to cross the border. The newspaper ‘Frontiera’; which is the border newspaper, writes articles about what is the best way to cross the border. The internationalization of economy and society creates flows of exchange or people between two or more nation-states. (Boyer and Drache, 1997) The success of this story is ninety percent. Unfortunately the figures do not lie, 1.954 immigrants die between Mexico and America last twenty years. People who cannot reveal themselves in their native country, such as Mexico prefer to go to the neighbour, which is the land of opportunity. They all saw the “American dream”. Unfortunately, your personal background and character qualities determines who will have a successful ‘Dream’ said Lawrence Raw. The separations of families, pain and suffering is a testimony that this wall violates the humanity but in addition the inequality of the thoughts and privilege to have the “American Dream”, creating , inequality and costs life. However, this inequality from the last 20 years is changing. According to Lucas (1998) and Firebaugh (2003) the ‘inequality transition’ and that global inequality has peaked so we can actually expect a decline. How long the wall will stand and how does the future look like? Obama is probably the only one who knows the answer. I am a consumer and I live in a capitalistic world. Global Economy – who are you?